During kata, reflect upon and remember that have died in the service of our country. Through your honor, their memory will not be lost. The long Memorial Day Weekend will soon be upon us. This is the weekend that traditionally heralds the start of summer; a season of “fun in the sun.” With that spirit in mind, I would suggest the following Sanchin Pilgrimage to all my Sect Of Sanchin members. This method of Sanchin practice is a favorite of mine; in fact, it IS my daily morning Sanchin practice. Date: So as to celebrate the start of summer, perform Sanchin any time during the long Memorial Day weekend being mindful of the salient points below. Location: Any location; however, I would suggest a natural, outdoor location that best represents the concept of “summer” to you; perhaps the sea shore, the mountains, a lake, even your own backyard while waiting for your grill to heat-up for the first BBQ of summer, be creative and celebrate your individual concept of summer. 1. Goshin-Do Karate Sanchin, like all “modern” kata (generally kata established or modified from the ancient kata after 1940) have a unique characteristic known as “positional coincidence.” Positional coincidence means that if a kata is performed with technical accuracy, particularly as to the stances utilized in the kata, one would start and conclude a kata at exactly the same point on the ground and in alignment with the overall starting position. Prior to approximately 1940, the older versions of kata did not necessarily have the characteristic of positional coincidence. While the majority of “modern” karate kata contain the concept, the lack of positional coincidence may still be seen in the older kata of Okinawa Kobudo (ancient weapons art) and kata of Chinese Kung-Fu. A confluence of events came together to bring you the following submission. Ultimately, the events helped bring me back from the edge of an internal abyss. It was from the edge that I crept back into a welcome feeling of normalcy; however that term is defined. I hope you find the within beneficial. It all started Memorial Day weekend. For most people, Memorial Day weekend is a celebration. It signifies the start of summer and all the natural wonder that summer entails. When I lived in New Jersey, that is what memorial Day symbolized for me. It held a special place in my heart. It meant that winter was over, the days would be longer and I could once again look forward to enjoying all that life had to offer. There would be visits to the Jersey Shore, the tip of Cape Cod, outdoor workouts at the Dojo (some in my backyard at home to the light of Tiki torches), barbeques, motorcycle rides and many other such pleasures. To be sure summer was a good time. 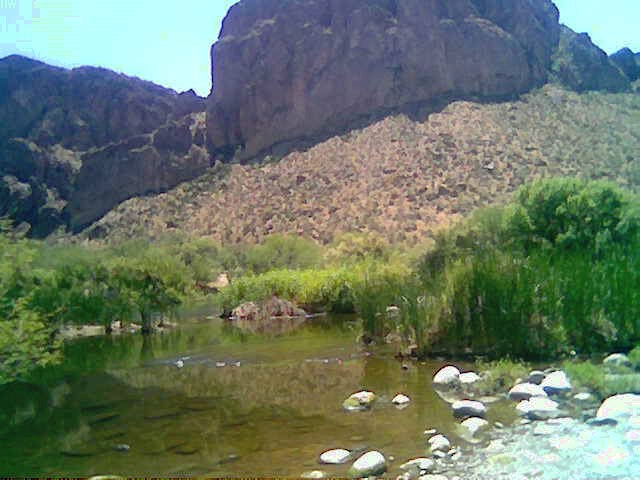 Now here in Arizona, for me anyway, Memorial Day weekend represents the start of the oppressively hot season. The days of summer will be characterized by daytime temperatures in excess of one hundred and ten degrees, UV indices exceeding a factor of thirteen (the extreme UV index) and ozone level air quality alerts. Summer is no longer good. Rather, it is something to be reckoned with, and even battled. Rather than celebrate Memorial Day weekend, I decided to work. The quid pro quo for working during the holiday was to be a day off on Thursday. I used Sunday to prepare for an upcoming lecture. The subject was to be an extension of my ideology of Jiriki Kata-Do as it applied to the following commentary by Friedrich Nietzsche. He who fights with monsters should look to it that he himself does not become a monster. And when you gaze long into an abyss, the abyss also gazes into you. (See Endnote # 1). Friedrich Nietzsche, in Basel, 1875. In the past, I had used this passage as a reference to monsters that were external to our own selves. By way of example, during my career as a criminal defense attorney, I often cited this passage in condemnation of police brutality and instances of prosecutorial misconduct. Recently I had seen an advertisement for a television show about parasitic human invaders called “Monsters Inside Me”. The advertisement had given me pause to re-examine Nietzsche’s commentary in light of the insidious emotional monsters that lurk in our psyche. This was to be the topic of the lecture. As the week progressed, I worked diligently on the lecture and other matters that required attention. Soon it was Wednesday night and my day of rest would be upon me. There was only one major problem. The weather forecast for Thursday called for a high temperature of one hundred eight degrees. While I looked forward to spending my day off fly fishing for trout on the Salt River, I dreaded the idea of the extent to which the sun would impose itself upon me. That is the paradox of a summer day in the desert. The sun is shining, the sky is bluebird blue, but the severity of the heat removes all desire to be outside. This paradox often angers me. The result is that I am often paralyzed by my anger. This anger oozes from my very pores to such an extent that my desire to engage in outdoor activity stops. This is my internal monster. I was about to do battle with it. I went to sleep Wednesday night with the monster quietly lurking in the dark recesses of my mind. On the one hand, I hoped a day of serene fly fishing would do wonders for my anger. On the other hand I did not anticipate being outdoors in the excessive heat. After a restless night’s sleep, I woke Thursday morning later than planned. Now angry and tired, I dressed in clothes with built in UV-50 sun protection and loaded the truck. I packed not only my fly-fishing equipment, but also a few old bass fishing rods and lures. By 8:00 am I had reached my favorite starting location on the river. As Chloe and I walked down the trail to the river bank, the sun was already sufficiently above the horizon to fully make its presence known. Upon reaching the water, my mood darkened further. I saw the remnants of slovenly float tubers who took advantage of the river over Memorial weekend. The spot was littered with beer bottles (no glass allowed, huh? ), beer cans, cheese-wiz jars and cold-cut plastic containers. I had hoped to fish as a means of battling my internal summer born monsters. Now, I was furious. I took time to clean up after these two legged pigs. While Chloe chased minnows in the shallows, I prepared my fly rod. I tied on a small dry fly. Dry fly fishing, where the fly floats on the water, is subtle and seductive. It requires finesse. Naturally, this was in direct contrast to my emotional state of mind. Chloe and I waded to a sand bar in midstream. The water was cool on our legs and provided a bit of respite from the heat. Still in a foul and dark mood I began to fly fish. I repeatedly cast and watched as my dry fly gracefully floated with the current. It was my hope that a trout would be tantalized by the dry fly and rise to strike it. Again and again I cast. My hope went unanswered. With each cast, my anger and frustration built. Slightly upstream a beautiful sleek, shining trout jumped. As I saw the fish completely clear the water, my heart quickened. I cast to the ripples of the trout’s rise with anticipation. My anticipation only sowed the seeds of frustration. My dry fly tantalized nothing. No trout struck at it. As the fly danced its solo dance, the seeds of my anticipation sprouted frustration. My frustration ripened to a renewed anger. My internal anger fully vented itself externally in the manner my fly casting. I wanted to catch that beautiful magnificent fish. I would release it anyway. As if insulted by my rude actions, the trout stayed away from my presentation. As a result of the ferocity of my casting technique, I snapped three successive dry flies off my leader. In one instance, I watched the disengaged fly float right past me. It was neither tantalizing nor seductive. It was pitiful. Enough was enough. I was done with the river that day. Perspiring from the effort of furiously casting spurned flies to magnificent trout, I splashed water about my neck and face. The ancient Egyptian Sun-God, Amman-Ra would have been pleased at the effect of its modern molten radiating ferocity upon my body and spirit. I returned to my truck. It was only about eleven o’clock. I did not want to return to heat imposed house-arrest. 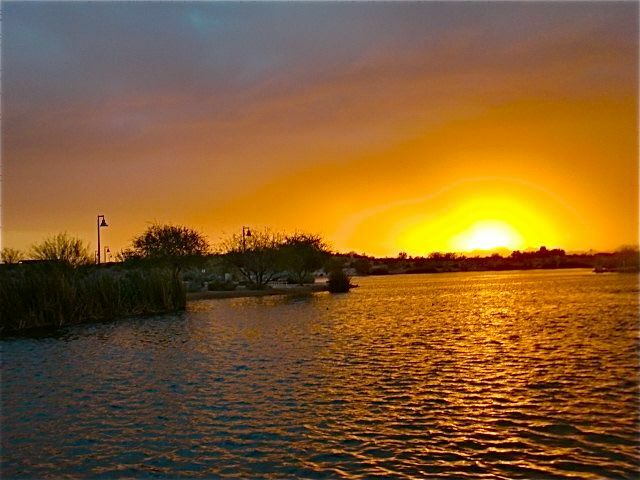 I decided that I would drive about three miles to Saguaro Lake and try my luck at fishing for bass. Unlike the usual serenity of fly fishing for trout, my fishing for bass tends to be aggressive. 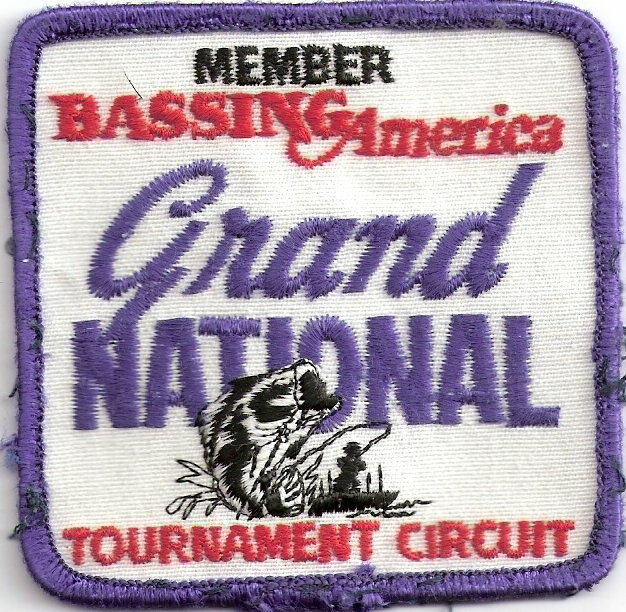 Many years ago, my brother and I had fished on a national bass fishing tournament circuit. Given the nature of tournament competition, I associate fishing for bass with competition, aggression and desire to succeed. I did an emotional inventory. I was still in a foul mood. I needed to not only battle my monster, but vanquish it. So time to fish for bass. I arrived at the lake. I found a fishing pier with an awning that provided shade from the glowing rays of the sun and settled in. As Chloe, lay down on her blanket, I tied on a rather large bass lure called a crank-bait (no pun intended, that is the name of the type of lure). Unlike the delicate nature of a small, less than a quarter inch dry trout fly, this lure was a hideous monster. It was about three inches long, orange and chartreuse in color. It resembled some psychedelic, prehistoric approximation of a gruesome baitfish. It was designed to cause a bass to angrily strike at it. If the bass was so tempted, its mouth would be skewered on one of two sets of treble hooks. This lure was not seductive like the dry fly I had fished with on the Salt River. This lure was dark and treacherous. This was the lure I needed to fish with. I hauled my rod back and with all my might cast the lure outward. The spool of the reel whirled and squealed. Once the lure hit the water, I reeled fast and furious. At last, a style of fishing to match my anger. As I reeled my lure in, it happened. I saw a great blue heron fly across my field of view. I followed its graceful flight. The flight path directed my eyes towards the distant cliffs. There, in the middle of two cliffs was the half-moon. It was just now setting in the distance. The moon had withstood the heat of the rising nuclear inferno of the sun as it heralded the dawn. Victorious, the moon was setting to rest in the horizon. It had survived the awakening ancient sun-God. In a few hours, it would again vanquish Amman-Ra. 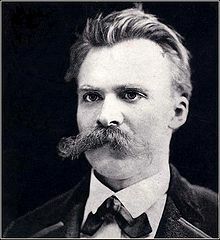 Like a thunderbolt, I thought of Nietzsche’s commentary and my lecture. I had become a living personification of the angry monster inside it. I hoped that a day of fishing would battle my anger. In the process, I externally became the angry monster. I sat down with Chloe. That was enough fishing for one day. Angrily casting to the dark depths of the lake was over. Now, it was okay to physically and emotionally go home. We all have our internal monster. These insidious emotional and spiritual attacks demand that we recognize, engage and even battle them. In engaging in the battle, we must recognize the inevitable withdrawal from the field of battle. In the case of our own internal battles this means that we must withdraw from the mental and spiritual battlefield to the Elysian Fields of spiritual well being. It is then that emotional and spiritual well-being will manifest itself externally into the world in which we inhabit. Until the next article, I hope we all successfully battle our internal monsters and avoid becoming the monster itself. 1. Nietzsche, Friedrich, Beyond Good And Evil, Part Four: Maxims And Interludes, Number 146. Please feel free to visit Sensei John’s new online store containing various Jiriki Kata-Do products with the unique logo of Sanchin. The Sanchin logo depicts the three battles of Sanchin in a new contextual paradigm. You may find Sensei’s store at http://www.cafepress.com/sanchin_logo. For more on either Sanchin Kata as meditation or my new book on Sanchin Kata, please feel free to visit the “Sanchin Book” page of this Blogsite, or my website WWW.Dynamic-Meditation.Com.For more information on my ideology and methodology of Jiriki Kata-Do, please review the articles herein filed in the category “Kata as enlightened meditation“.